Art. C609 Chalice h. 18 cm. Art. 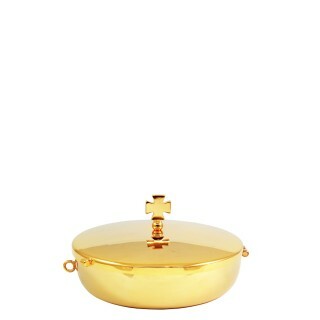 C619 Ciboria h. 16 cm.24k gold plated brass C.. 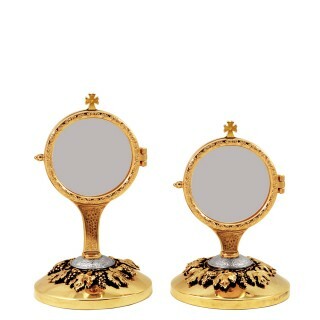 Fabric case completa of 24k gold plated brass sprinklerAvailable in different sizes:Art. Y818D ..
Art. C610 Chalice h. 18 cm. Art. 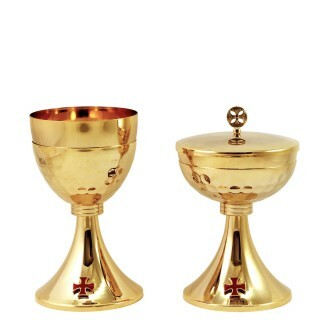 C620 Ciborium h. 16 cm.Hammered Chalice and Ci..
Art. R145-03 Hand-painted chalice pall made of damask jacquard with red stoneSize: 15 x 1.. 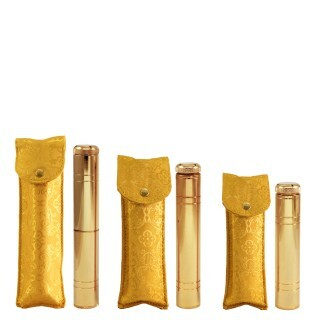 Fabric case complete of silvertone brass sprinklerAvailable in different sizes:Art. Y874 Fabric..
Art. C449Ø cm 8 x 15 cm.Art. 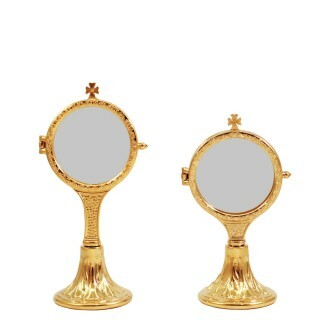 C449LØ cm 8 x 18 cm.Grape style monstrance for Hostia Magna ..
24k gold plated brass paten with hingeAvailable in different sizes:Art. P395Ø 12 cm. Capacity 80 Hos..
Art. 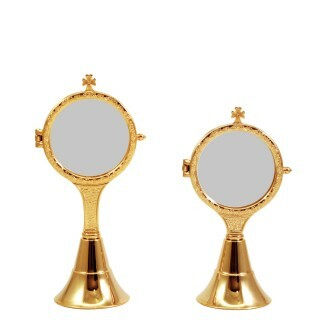 C628 Chaliceh. 18 cm.Art. C632 Ciboriumh. 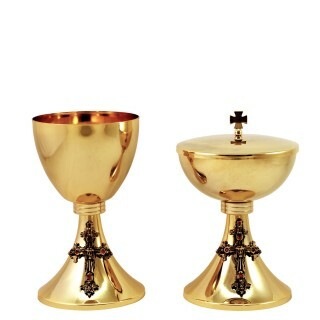 16 cm.24k gold plated Chalice and Ciborium .. 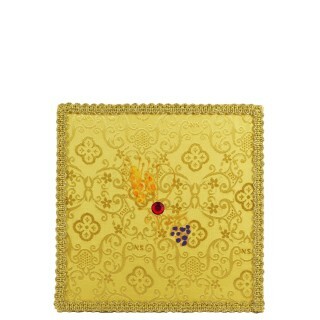 Fabric case complete of 24k gold plated brass sprinklerAvailable in different sizes:Art. Y874DFabric..
Art. C205 Ø 8 x 19 cm. Art. C205L Ø 8 x 20,5 cm. Monstrance for Hostia Magna ..
Art. 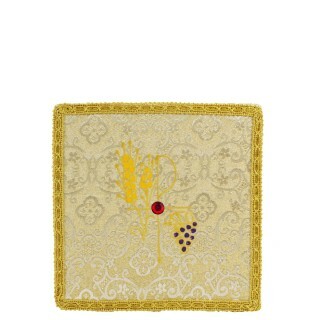 R145-05 Hand-painted chalice pall made of yellow jacquard with stoneSize: 15 x 15 cm..
Art. C328 Chaliceh. 18 cm.Art. C329 Ciboriumh. 16 cm.24k gold plated brass Chalice and Cib..
Art. C211 Ø cm 8 x 17 cm. Art. C211L Ø cm 8 x 19,5 cm. 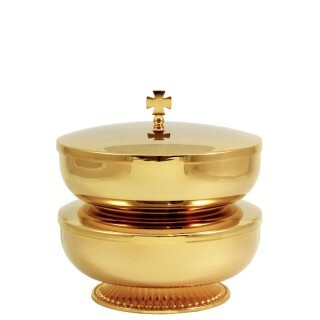 Monstrance for Hostia Mag..
Stacking double ciboria made of 24k gold plated brass Art. P393Bowl Ø 14 cm. 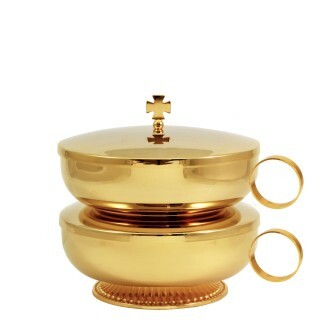 Cap..
Stacking double ciboria made of 24k gold plated brass with handleArt. P397Bowl Ø 14 cm. Capacit..